We are heading out on the open road for our family vacation tomorrow. I remember driving to Florida as a kid with my family. This will be our family’s first real road trip. 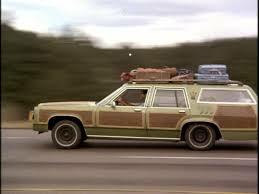 All I can think of is packing up the Family Truckster from the Vacation movie. First we are going to Philidephia to see the Liberty Bell and the Betsy Ross house. It’s about 350 miles away. That is seven hours in the car with the kids. I think the longest we have done before was around 2 or 3 hours. The kids are bringing their tablets to read and play games on, maybe they will even write something for their blog. I think when we were kids we fought with each other for entertainment. After Philidephia we will head to Maryland an DC. It’s the first leg of this trip where the adventure begins that I am looking forward to. It should be interesting to say the least, I just want to know why the song “Holiday Road” keeps playing in my head. This entry was posted in Family and tagged adventure, family, Philidephia, Truckster, vacation. Bookmark the permalink.